I didn’t bother to link to the Jared Leto Joker pic, since I’m assuming it’s already been inflicted upon you. Turned out I had the wrong link to Bully’s Ambush Bug Birthday post in last Thursday’s entry…it should have gone here, so go ahead and visit that link in case you were wondering why I was sending you to one of Bully’s Star Wars entries. Not that you shouldn’t be reading those, too. Best wishes to Ty Templeton, who recently experienced a heart attack and reports on his own recovery in the Mighty Ty Templeton Fashion. I don’t talk enough about his work here, but I’ve been a fan of his since Stig’s Inferno (read it all here, legally, for free! ), and if you can get your hands on a copy of 1987’s Amazing Heroes #111, that’s one humdinger of an interview with the man there. Also, Cartoon Brew posted a bunch of the character one-sheets for the forthcoming CGI Peanuts movie, in case you wanted to know what real-ish hair on Snoopy and Lucy looked like. I actually am looking forward to seeing what they do with this film, and as someone who managed to survive the 3D Viewmaster Peanuts dioramas, I think I can handle the CGI versions. I do have to say I’m not a big fan of the taglines on the posters, but it’s marketing, so What Can You Do? “Dust a Move,” indeed. And in other news…I can’t wait for Dark Knight III to come out, which is a sentiment I’m sure I share with many of you out there. I’m still gathering comic industry predictions for 2015 in the comments for yesterday’s post…get yours in while the getting’s good, or something like that. Longtime ProgRuin reader/commenter Walaka dropped by my store recently and reveals all the sordid details right here! Internet pal Karla has a Kickstarter for her forthcoming children’s book that’s not for children Inspector Pancakes Helps the President of France Solve the White Orchid Murders . I contributed, because I must see the finished product. Hopefully you can contribute, too. Seriously, that is one terrible Magneto. Pal Andrew has a few words to say about Marvel’s New Universe, and one title in particular. Bully, the Sharp-Dressed Stuffed Bull, is celebrating Paper Doll Month! I mean, you all cut your paper dolls out of your comics and dressed them up, right? …No? What are you, chicken? Pal Dave looks back at merchandise for the original Alien movie, including that awesome and enormous figure of the Alien itself. Jason Sandberg, of Jupiter fame (and you guys know I like the Jupiter ) has some Jack Kirby-inspired paintings up on his site that you should look at, because they’re awesome. And click through to check out more of Jason’s work, too. And then there was the time Eddie found the worst Magneto doll of all time (scroll to end of post). The Elektra one he also found ain’t great, but it’s a photorealistic representation of Jennifer Garner compared to that Magneto. Surely somewhere there is a photo of Gorgeous George with Bess Truman. § June 2nd, 2014 § Filed under sir-links-a-lot Comments Off on Surely somewhere there is a photo of Gorgeous George with Bess Truman. So there’s a Kickstarter for a new comics anthology called Cringe , in which cartoonists relate stories of “personal humiliation, shame & awkwardness,” which, you know, hey, all right! But I took a look at the list of contributors and saw that my old pal Fred Noland is participating and I couldn’t donate money fast enough. Dog Boy creator Steve Lafler is also joining in the fun, and I think you all know how much I like Steve Lafler. I am actually still expecting this character to return in some form, someday. Maybe even in a Spider-Man film, once they run through all the other antagonists in the next couple of sequels. Sure, poking a little fun at Mr. Liefeld may seem to be old hat, but that “After” picture is amazing. And disturbing. And, perhaps, just a little upsetting. Well done! This is what I picture the eventual live-action Youngblood movie to be like. Dave had Battle Beasts. I couldn’t even tell you what they were, beyond occasionally coming across this Blackthorne series at the shop. I have multiple pals Andrew. Crisis on Infinite Earths tie-ins were a hell of a thing. Pal Andy is trying to raise funds on Kickstarter for his children’s book SpaceBear , so please help out if you are so inclined. REMINDER: the Ultimate Powers Jam continues, in which Pal Andrew rolls up a character using the Marvel Super-Heroes role playing game system, and other folks step in to flesh out the character. Probably better than whatever comic you’re reading right now. Unless that comic is All-Star Batman , and nothing is better than that. AND NOW, A MESSAGE FROM OUR SPONSOR: please buy some stuff from our shop’s eBay store. Dig some of these shirts, man. This Jar Jar shirt is made from real Gungan skin. Help me clear some of this stuff out…I need to make room! Thank you. Humble Opinions…a new site offering comics and pop culture reviews and commentary. “Everything in Greece was on fire all the time” made me laugh. I haven’t linked to swell chap Tony Isabella in a while, so here’s today’s post of comics reviews. I haven’t really gone out of my way to seek out other people’s opinions of the current Superman books. I’ve been enjoying them, thinking they’re an improvement on what’s been going on with the character since the New 52 hoohar began, so I was interested to see Mr. Isabella’s somewhat-opposed take. It was pointed out in the comments that the Sluggo doll from this post was probably just some other doll repurposed into a Sluggo doll, and yeah, that’s probably what happened. It was still apparently marketed as a Sluggo doll (along with a Nancy doll) in the 1950s as a Post Grape-Nuts cereal promotion. Here’s a shot of them in their box. …Phew, Nancy didn’t make out so great, either. Assuming that is supposed to be Nancy and not some generic “Girl Friend” as the box would have it. Emailed to me by everybody: an installment of the Rhymes with Orange comic strip starring a certain muck-encrusted mockery of a man of some note. Blogging brother Tim points out an…interesting “Bullpen Bulletins” from the desk of Mr. Shooter. The CO2 Comics folks write about comic creator compensation in this brave new world of big budget movie adaptations…and notes that Bill Mantlo’s financial benefits from the Guardians of the Galaxy movie may not be as dire as assumed. Here’s a new comics blog about selling off one’s collection, and about the urge the drives the need to create such a collection in the first place. Seems like it’ll be interesting. Bully‘s pal John presents 13 great Spirit splash pages…and Bully has a fourteenth! I suppose coveting a $100+ Swamp Thing figure undermines any criticism I make in an End of Civilization post. …having been first emailed about it by reader John K. a few days ago. The figure looks cool ‘n’ all, but at a total cost of about $140 including shipping (according to Google’s currency converter) I’m probably going to hold off for the time being. 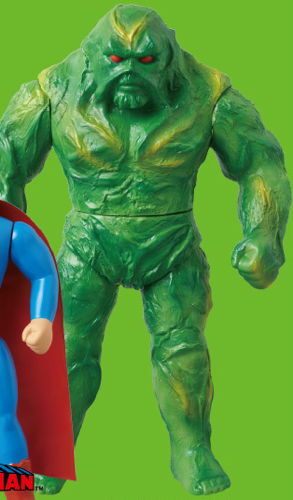 However, whilst doing the aforementioned prepwork for the EoC, I did spot the other two figures from this particular wave (Superman and Bizarro) being offered in the Previews Import Toys section, so perhaps there’s hope I’ll be able to get my weirdo Swamp Thing toy at a wholesale price via my evil retailing powers. While taking a peek at Kickstarter’s funnybook listings, I happened upon this fundraiser for A Deitch Miscellany , a handmade book collecting comics and sketches by Kim Deitch. Well, I like Kim Deitch’s work, and I hope some of you do as well, so maybe take a look at this project and donate if you’re able. Bob writes about starting to read B.P.R.D. on a monthly basis, partially in response to my comments about the current steep entry cost to that series. Tom Spurgeon responds by saying he’d rather not see a rebooting of B.P.R.D. , which isn’t really what I want, either, but at this point the series isn’t too kind to anyone new to the franchise. Of course, as we’re all learning again right now with the “Marvel Now #1s” publishing initiative, a relaunch is a jumping-off point as much as a jumping-on point, and starting again with a new B.P.R.D. series (without an attendant Hellboy movie to bump up some awareness) would likely, after a brief spike in sales, end up just selling to the same people who were already buying it before. As I said, I can see this B.P.R.D. ending and wrapping up its years-long storylines, and the current Abe Sapien title incorporating the B.P.R.D. elements in a perhaps more reader-friendly manner. (Much in the same way I once argued that the Legion of Super-Heroes could be revitalized by making one of the Legionnaires the star of his/her own book, and the rest of the Legion the occasionally-appearing supporting cast.) I wouldn’t think of that as a full-on “reboot” so much as some retooling, but I’m likely just splitting hairs. No time for posts, Dr. Jones. Congratulations and / or my sympathies to my blogging brother Tim on his ten year reign. Employee Aaron’s wife Kempo has drawn Judge Dredd. If this is how he appeared in that most recent movie, maybe it would have made money. Yes, I’ve seen the Onion article. And they’re wrong; those are the only two movies. Well, and The Spirit , too. In which I link to some pals, but somehow make it all about me instead. Bully, The Stuffed Bull That Is Slightly More Little Than Other Stuffed Bulls, wishes me a Happy Blogoversary in the way only he can…with a search for Swamp Thing. NOT COMICS, BUT INTERESTING: pal Dave lists his Top Board Games of All Time, parts one and two. …It’s very strange, that I like reading about board and war and strategy games more than I like actually playing them. 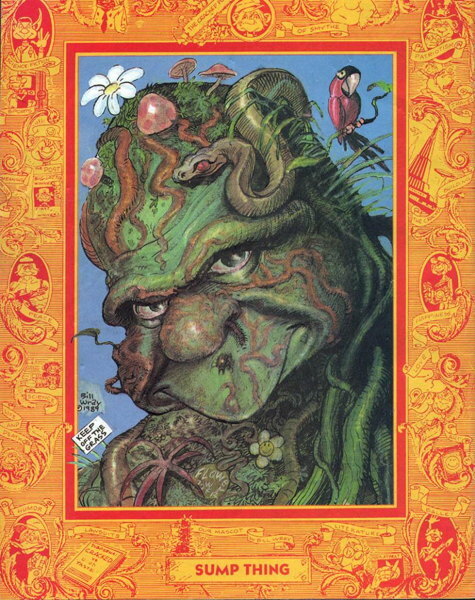 I don’t know how many books I’ve read about game histories and reviews and such over the years, when the last board game I played was probably a half-assed attempt at some Monopoly-ing at a friend’s house about twenty years ago. Oh, hey, it’s Christmastime, so that means pal Andrew is up to his Nobody Else’s Favorites tricks again, starting with Snowbird, and moves on to very eloquently explaining the odd appeal of John Byrne’s run on West Coast Avengers . It may have been peculiar, and, as Andrew says, incomplete, but images from that run still stick in my head decades after I’ve read it. Sometimes I poke in on my brother-from-a-Canadian-mother Steven’s website to see if he’s up to anything. Not a whole lot at the moment, but the header for his website makes me smile.